The Serenity project is a labor of love. We are thrilled to have partnered with Eisai pharmaceutical as well as Metavivor Research and Support, to bring attention to people living with metastatic breast cancer. 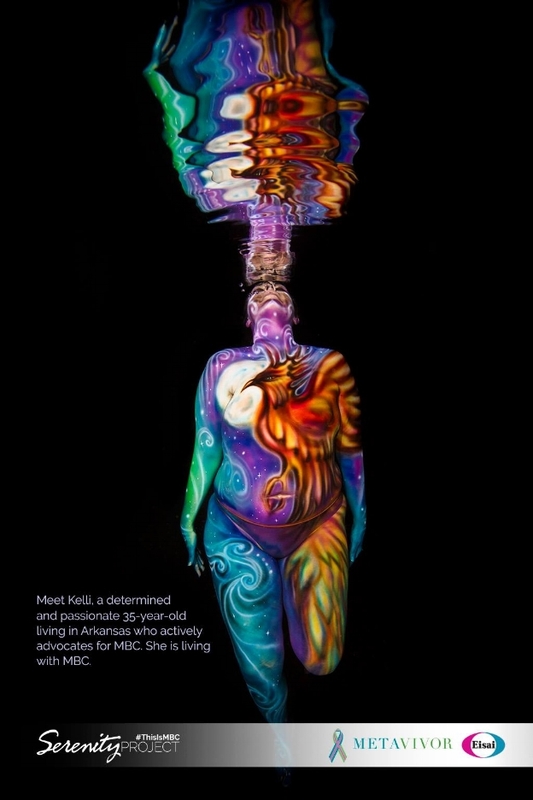 This project featured 16 participants who are living with MBC. Each of them were flown to our region on an all-expense paid trip, for the purpose of creating unique art spotlighting their stories. They were bodypainted with waterproof paint at the Faces by Ren studio, then taken to local private pools for an underwater shoot with Keith Dixon Studios. The art is being used in conjunction with their stories and shared with the world, including a gallery showing of all art and opening reception in New York City that took place in October of 2017 at Venue57 in uptown. Director Beth Fairchild is a mover and shaker in the metastatic world, changing dialogue and treatment options through advocacy, public speaking, and a variety of other events and projects. She is currently the president of Metavivor; metastatic breast cancer awareness, research, and support. My husband Keith lost his former wife Serenity to metastatic breast cancer in 2010, and I lost my mother to this devastating disease in 2002. This project is very personal to both of us. We will share behind-the-scenes when possible. Please feel free to join us for a journey of beauty, advocacy, storytelling, and truth-telling through unique art by following our pages on Facebook and Instagram or by following Metavivor. We are so excited to share this project with you as it unfolds, along with stories of survivors. Right here in the mountains of Appalachia, we are creating art to inspire, spark new dialogue, and educate. Thank you for being here. From the Metavivor website: "In the United States, someone dies from breast cancer every 14 minutes. This number has not decreased significantly in nearly 40 years despite a huge movement to raise awareness and funds for breast cancer research. Just wearing, buying, or even walking for "pink" does not reduce deaths from breast cancer. Scientists know that research specifically focused on metastasis is crucial to significantly reduce the breast cancer mortality rate. Metastasis research is challenging for various reasons. However, the biggest obstacle is lack of funding: only an estimated 2-5% of the funds raised for breast cancer research is spent on studies of metastasis." If you would like to see the video interviews with each participant, and see the images each month as they are released, please check out this page at MBC Info. Center. I hope you'll follow along to learn more and be inspired.